I've spent a lot of time lately organizing my activities in individual pockets that I store in a filing cabinet by my desk. I blogged about how I'm keeping more organized this year here. So, I've decided to start a new blog series where I share with you a peek into my filing cabinet. Each volume of this series will include 4-6 activities from my filing cabinet. I'll either share with you the files I created or share where I found the resource online. This year, I tried Sara VanDerWerf's 1-100 Challenge for the first time on the first day of school. It was a huge hit! My students were SUPER-engaged, and it was a great springboard to discuss what groupwork should look like. You can learn more about this post at Sara's awesome blog. Here's the general gist. Students are given a sheet of numbers that *appear* to be randomly arranged. 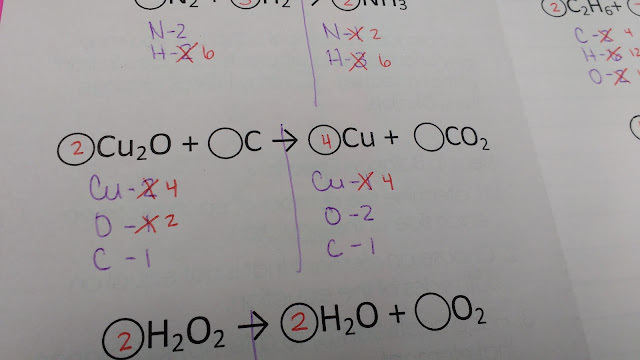 The first student in the group must color 1. 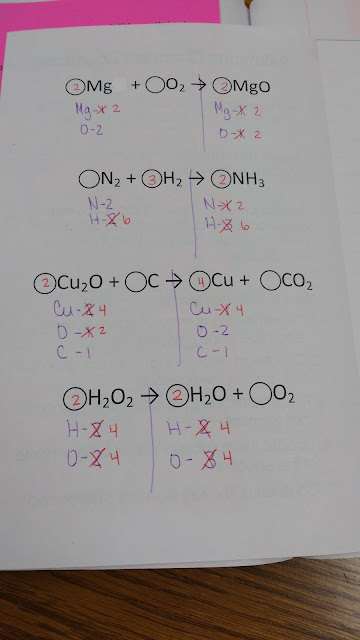 The second student must color 2. Students continue going around the group coloring the appropriate numbers. 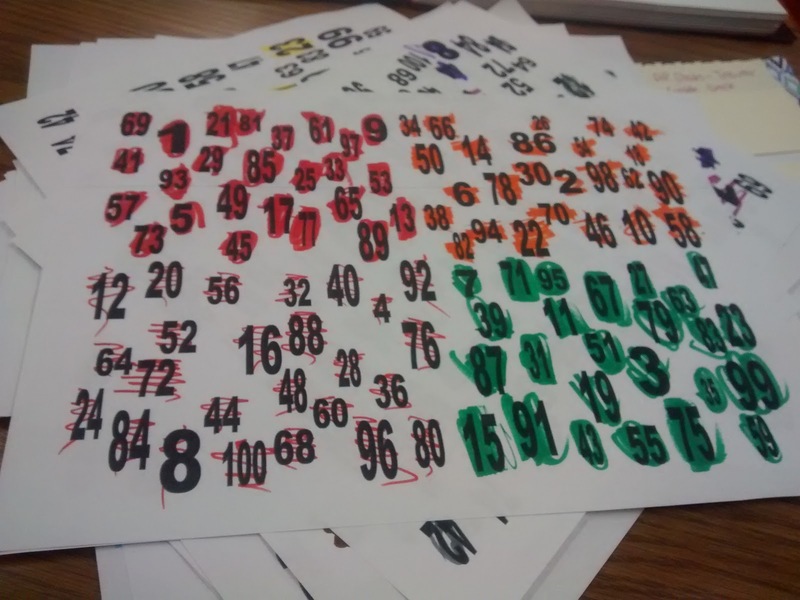 They can help their teammates find their numbers, but they may not color the numbers for them. If students are in groups of 4, a colorful pattern will soon emerge if they are paying attention! I found this square puzzle on a puzzle site. I created a printable version using Publisher. Then, I printed and laminated them to make a class set. I give my students three challenges. I blogged about this puzzle in more detail here. You can also find a link to download the file and make your own set. My students usually have no problem doing Challenge 1 and 2. Challenge 3 turns out to be a real challenge. And, I usually only have 1 or 2 students figure it out. Whenever I use these with my students, I usually have to set a timer to let them know when we will stop. Otherwise, they will want to keep going, and we'll never get to our lesson! I love the 24 Game, so I was super excited when I found a PDF version with printable cards on the website of Minneapolis Public Schools. You can read more about this activity here. 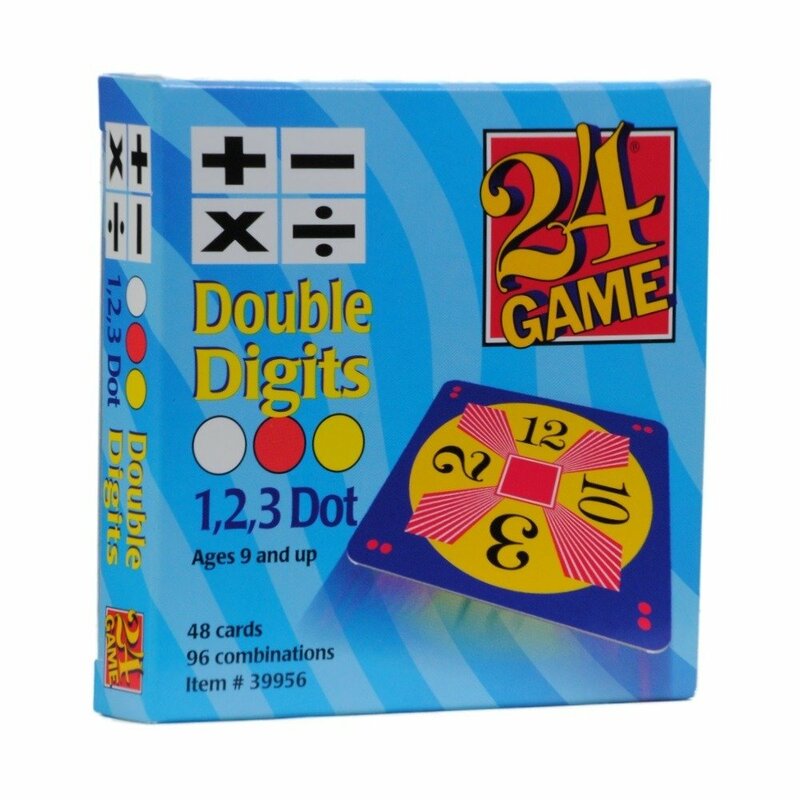 The goal of the game is to make the number 24 from the four given numbers. You may add, subtract, multiply, or divide the four numbers. Parentheses may also be used. You can purchase different types of 24 Games from Amazon (affiliate link). 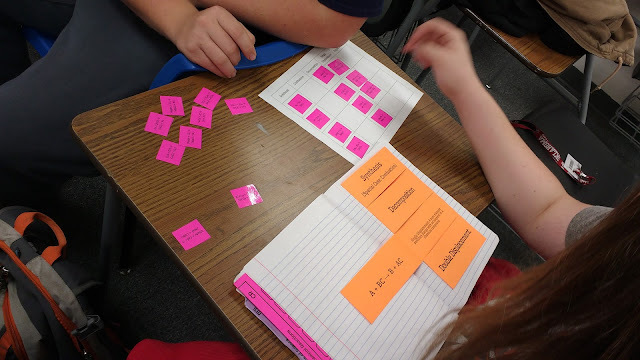 Last month, my husband and I played a couple of rounds of Double Digits (affiliate link) against each other, and some of the problems were super-tricky even for us math teachers! This is a great activity to use to reinforce the order of operations. This challenge was inspired by a puzzle posted by Will Shortz on NPR's website. The goal of the problem is to use the digits 5, 4, 3, 2, and 1 (in that order) to create as many numbers between 1 and 40 as possible. You can add, subtract, multiply, and divide the numbers. 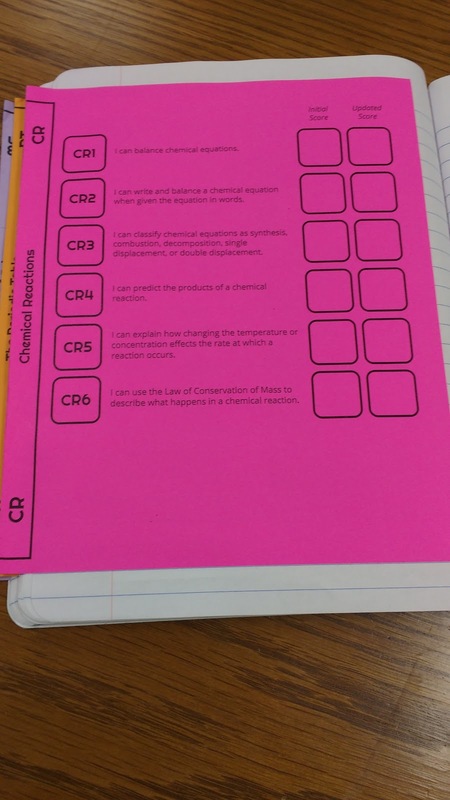 I created some recording sheets for my students to use to attempt the puzzle. This is another great puzzle to practice using the order of operations. 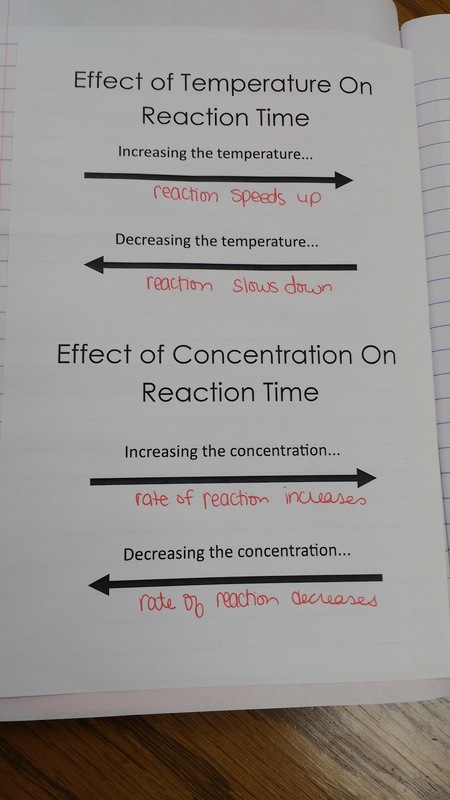 I also made a poster-sized version for a full-class activity. 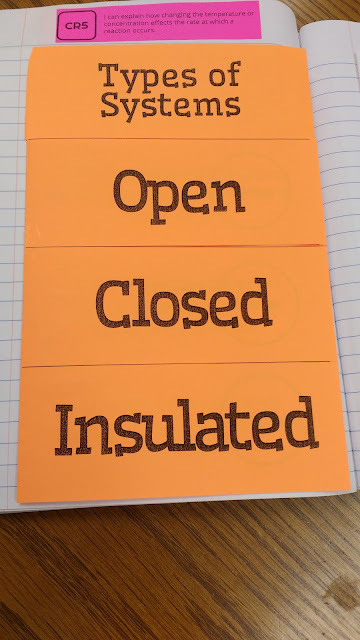 I've posted all of the files I created for this activity here. My students really enjoyed the challenge. 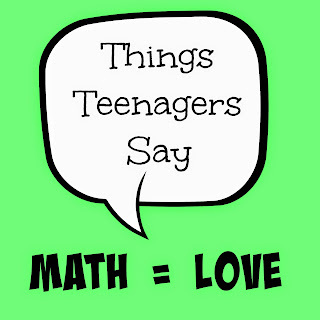 I used it with both my lowest math class (9th graders not yet ready for Algebra 1) and my highest math class (trig). 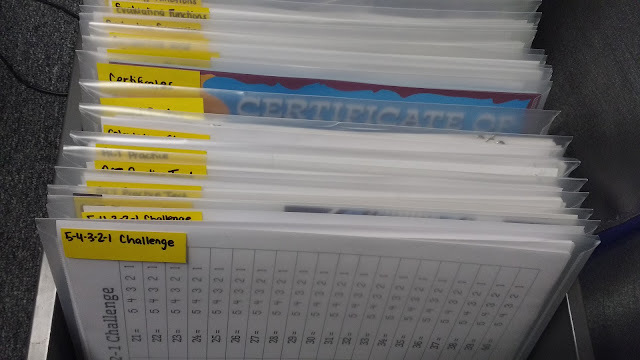 Hope you've enjoyed this peek at some of the activities in my filing cabinet! It feels like it's been FOREVER since my last things teenagers say. So, I guess we should remedy that. Hope you're having a happy Thursday! Student 1: Will I get my phone back at the end of the hour? Student 2: She's eating a banana, so obviously not. Did you know that in an alternate universe that might actually make sense? 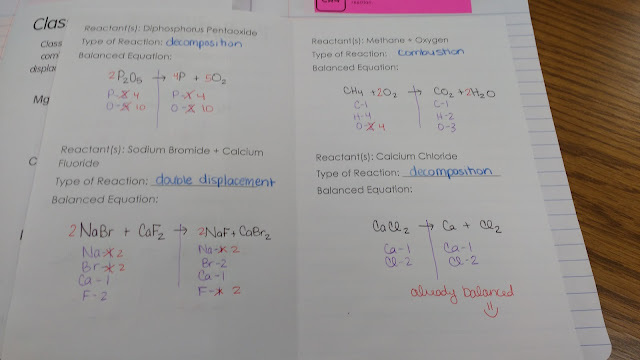 Mrs. Carter, you may think someone took my notes for me, but my handwriting is just on point today. Student: Are your husband's legs still dark from the summer? Me: Ummm...I'm just going to walk away now and pretend you didn't just ask that. Don't ever bite into soap! Dude! She's never brushed her teeth with deodorant before! I write my 2's like an adult now. I want to skip school in my closet. You have a mom, too?!? Why does spaghetti smell like puke when you go to wash the pan out? I locked him in my trunk one time. I don't smell like cigarettes. I smell like laundry detergent. Guys, I almost didn't wear a hat this morning. I woke up and looked in the mirror. My hair looked like a rooster. It looked like a good rooster! Student 1: You don't like peanut rolls?!? Student 2: No, I said I don't like funerals! You know what's fun? Not being single. Do you remember how you didn't like the word "gizzards" in the fourth grade? Student 1: Can we listen to the Hamilton soundtrack? Student 2: We're reading Hamilton in English class! Student 3: No, we're reading HAMLET. I have a box of playing cards in my room to use for stats experiments and various activities. Do you want to play 120,000 card pick up? Did you know that if you add five years to your age it will tell you how old you will be in five years? Student 1: My Christmas tree weighs over 300 pounds. Student 2: There's no way that your tree weighs as much as a semi truck. Are your pants on backwards? Jesus loves you. But, he doesn't love you anymore because you kicked my friend out of lunch detention. They are bottle flipping, but my religion is against that. Can you please tell them to stop? Student: Is it possible for a Mexican student to fail Spanish class? Me: I don't know. We speak English. Do any of our students fail English class? You need to tell Mr. Carter to step up his game. His room is not as colorful as yours. They have Subway in Australia? I didn't even think they had towns there. So if you're blind and eat carrots, do you get your eyesight back? Student: What? This isn't a free country? Me: It's not a free country when you're in lunch detention. Student: That's not what the Bible says! Student 1: They are going to deport Trump. 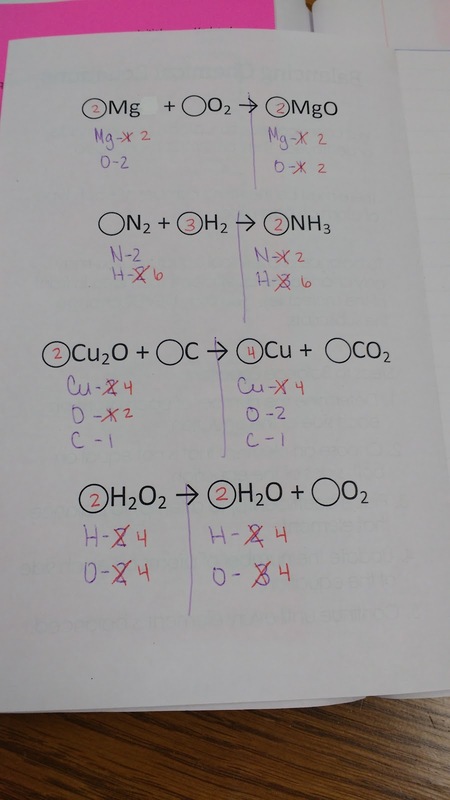 Student 2: That could happen. He's Swedish. Student 1: He is pretty sweet. 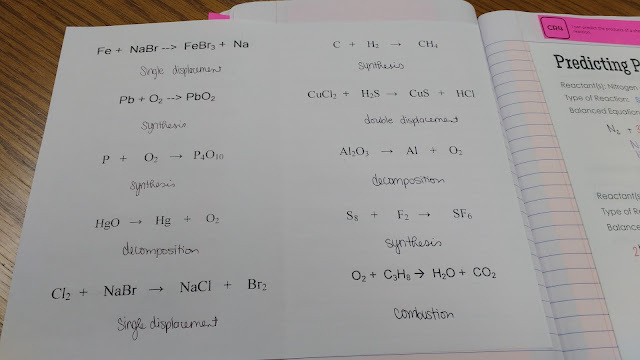 Student: My hand is cramping. I'm going to have arthritis because of you! Me: That's why we completed our notebook over the course of the entire semester. You're trying to do it all in one day. Of course your hand hurts! One of the reasons I adore my physical science class is that they love the posters I have hanging up in my classroom. Decorating my classroom makes my heart happy, and the fact that I have students who take the time to show appreciation for my hard work just makes my heart even happier. A couple of weeks ago, my students insisted that I needed to make a mole poster with Avogadro's number. 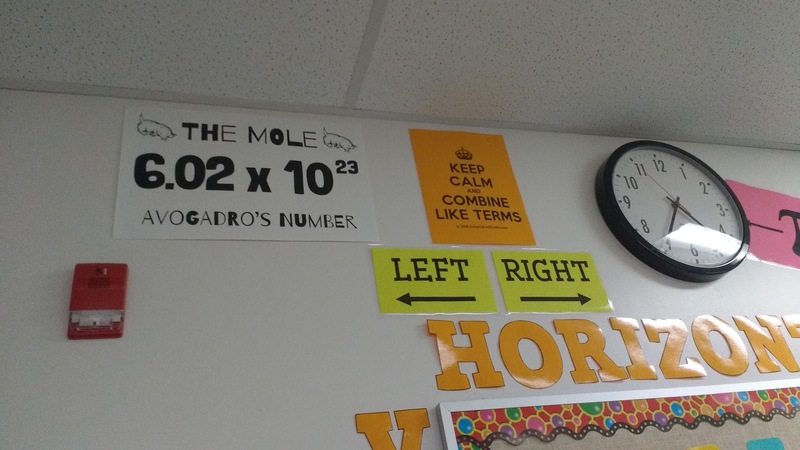 Of course, I'm pretty sure that 6.02 x 10^23 was stuck in their heads long before I got the poster on the wall because we have done SO MANY stoichiometry problems! 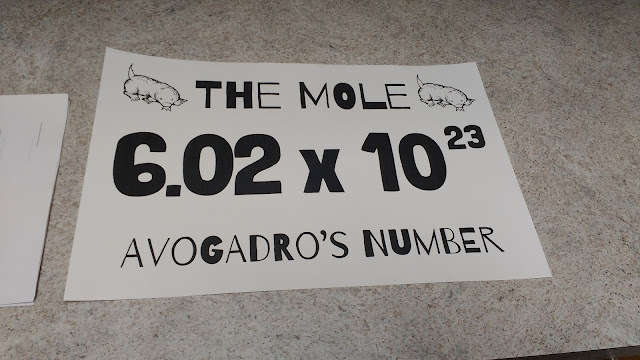 The mole clipart is from www.supercoloring.com. I printed this poster on 11" x 17" cardstock (affiliate link). 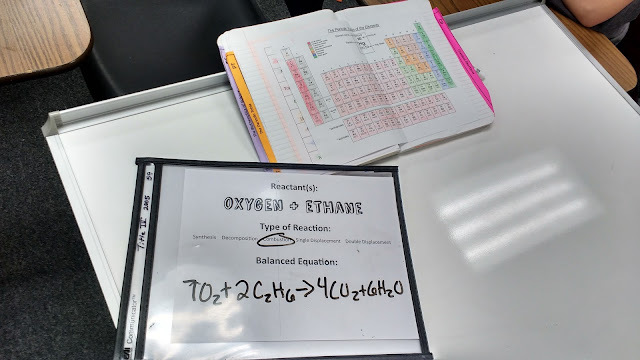 This stuff is my go-to to making quick posters for my classroom! 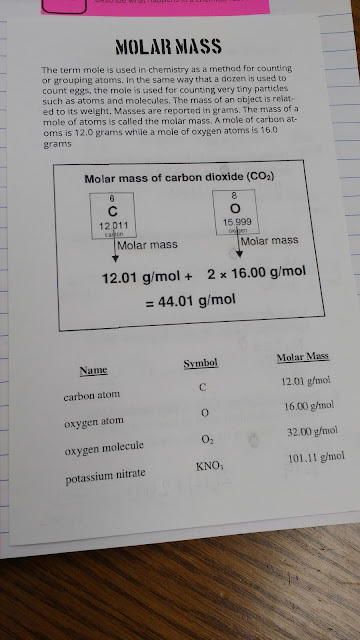 It's the biggest paper size that my school's copy machine handles. Here's a couple of pictures of the poster hanging up in my room. This summer, I blogged about a great number of logic puzzles created by Naoki Inaba (a Japanese puzzle maker) for use in math classrooms. Most recently, I blogged about his Zukei Puzzles which many of you have used in your own classrooms. After a twitter conversation today about Inaba's Angle Mazes, I decided to translate the rules to English and condense them into fewer pages since so many of you seemed to find that useful with the Zukei Puzzles! Here is the instructions for the Angle Mazes as provided by Inaba. Inaba also provides an example of what not to do and what you should do. 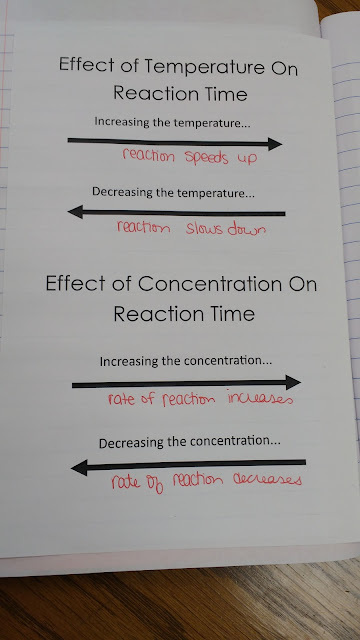 The first example will be incorrect if you continue following the arrow to complete the path. You are not allowed to use any circle more than once. 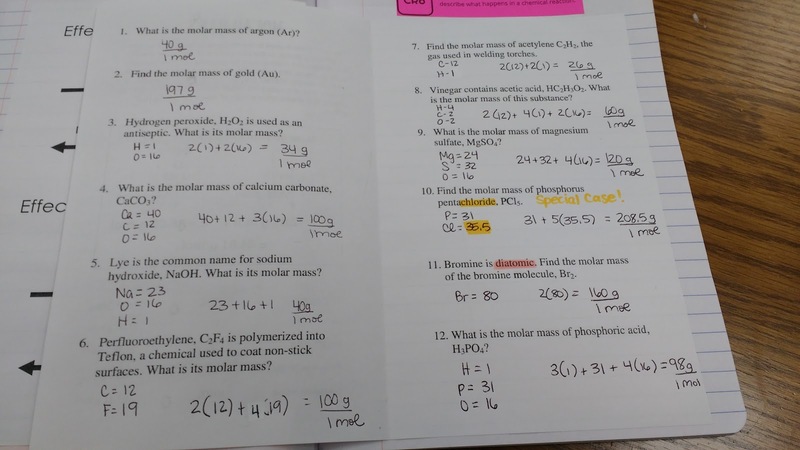 The original file included 38 problems for students to solve spread over 7 pages (8 pages including instructions.) I have condensed the puzzles to fit on 5 pages. The last two puzzles are rather large and had to be placed on the 5th page. If you are content with having only 36 problems, you could just print the first four pages front and back and use only two pages. 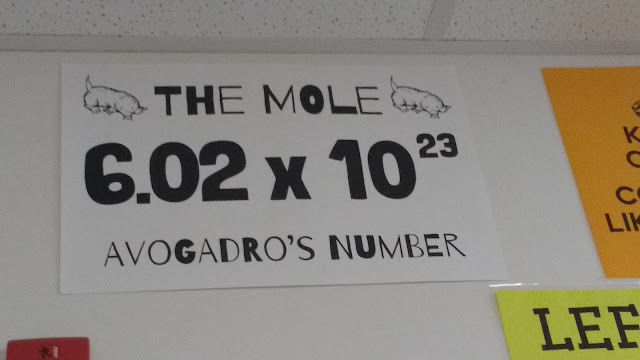 I used these as a quick warm-up with my trig class yesterday, and my students really seemed to enjoy them. 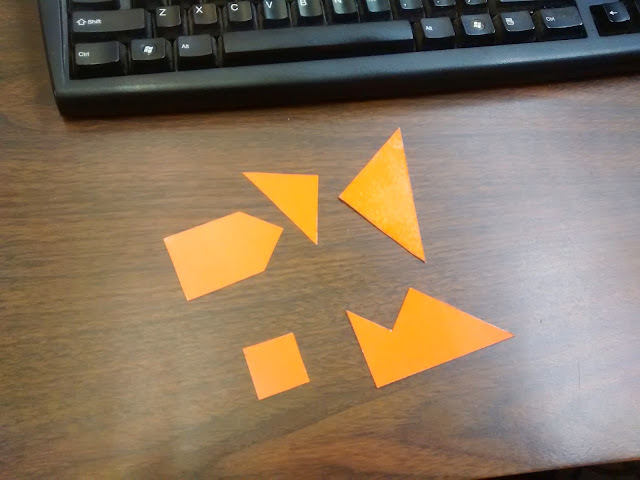 My student aide in my trig class asked if I could print all of the puzzles for him. I think that means this puzzle is a winner! If I taught geometry, I would definitely find a way to incorporate these into my class. 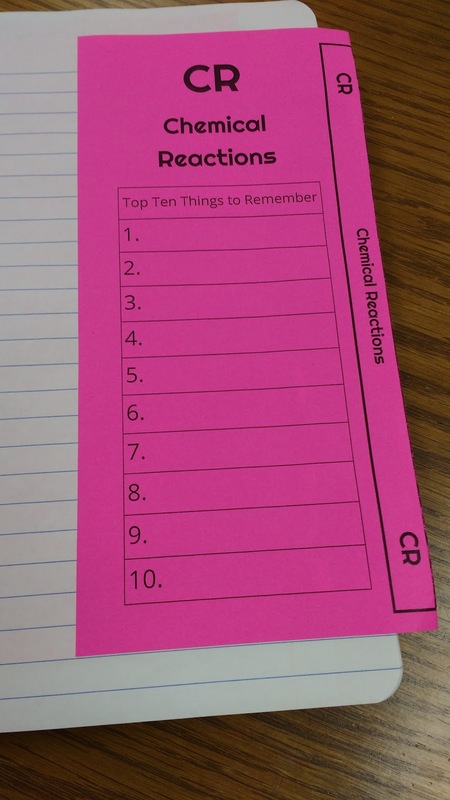 I think I will start using them as warm-ups in my Algebra 1 classes. File is uploaded here. You can find Inaba's original Japanese version here. Solutions are posted here. 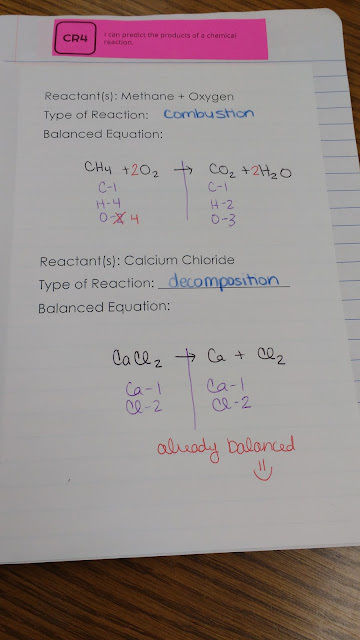 My physical science students are almost done with our unit on chemical reactions, so that means it's time to share our interactive notebook pages. 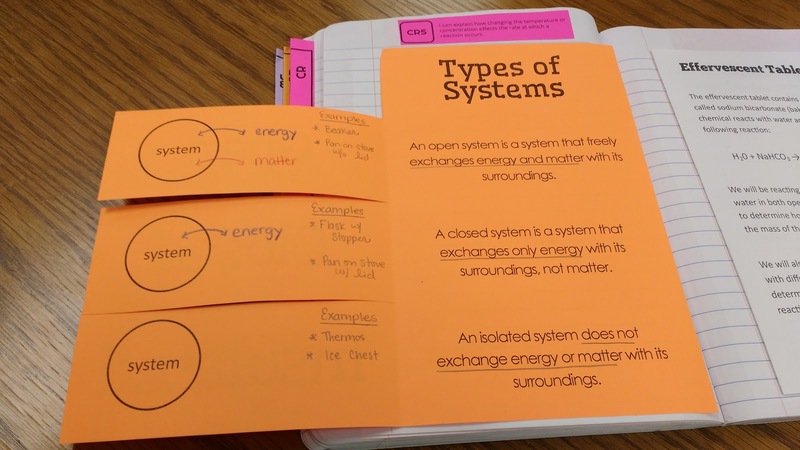 Each unit starts out with a unit divider. You can read more about these here. The other side of the divider features our SBG skills list for the unit. We had 6 skills. In retrospect, I should have taken the 6th skill and turned it into an entire unit over the mole. 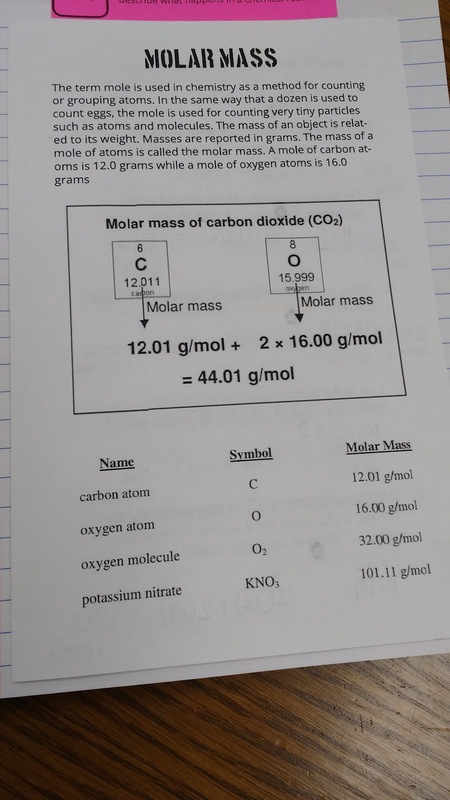 However, when I was reading the standards at the beginning of the year, I misunderstood exactly what was required in regards to the law of conservation of mass. Here's a close-up of the skills list. 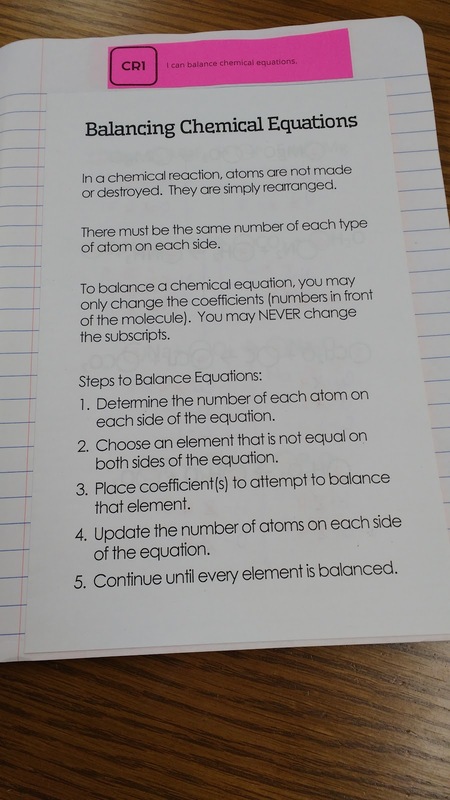 We began by balancing chemical equations. 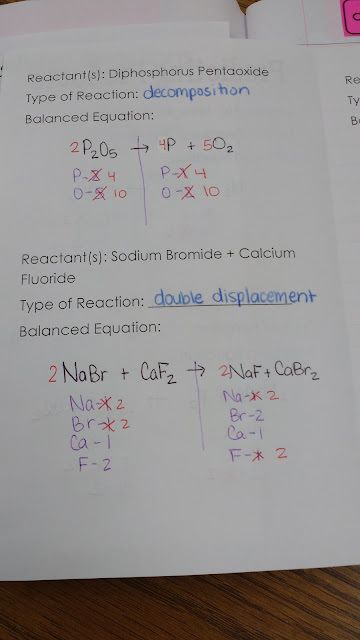 When I took chemistry in high school, I ADORED balancing equations. Each problem was like a mini-puzzle. And, I love puzzles! I put a circle in front of each reactant and product to show students where to write their coefficients. 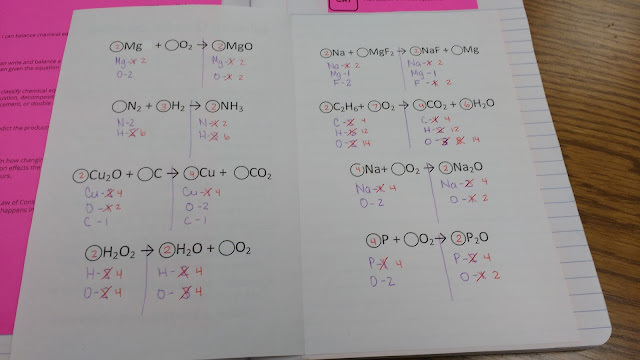 Circles turned out to be a bad idea for this because some of my students mistook them for zeros. I guess I should use rectangles in the future. 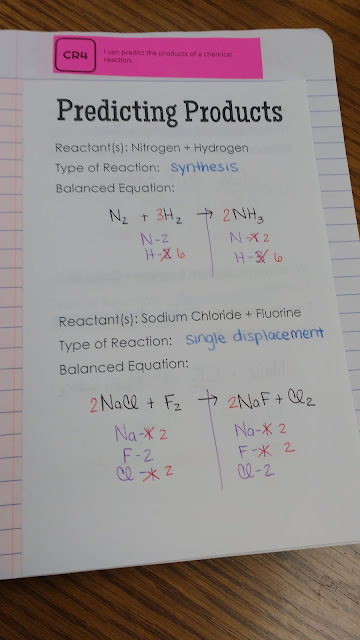 After we had the hang of balancing chemical equations, I had them translate the equations from words to symbols and then balance them. 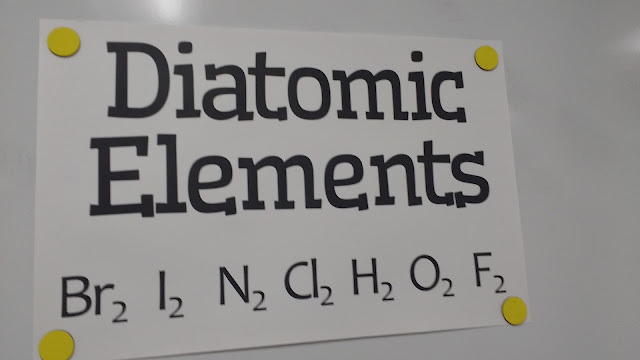 My students definitely appreciated the diatomic elements poster I made for them to reference! 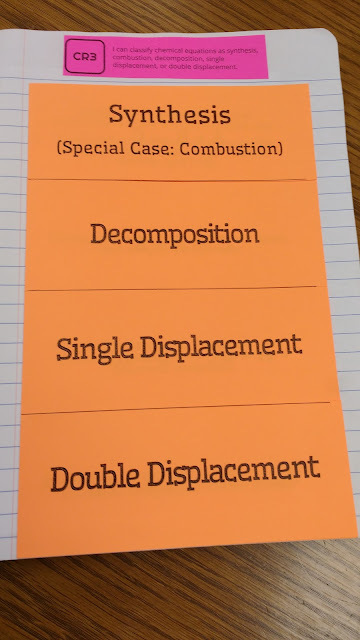 In the future, I would put synthesis and combustion on the foldable separately. Having them on the same flap caused a lot of confusion for my students. 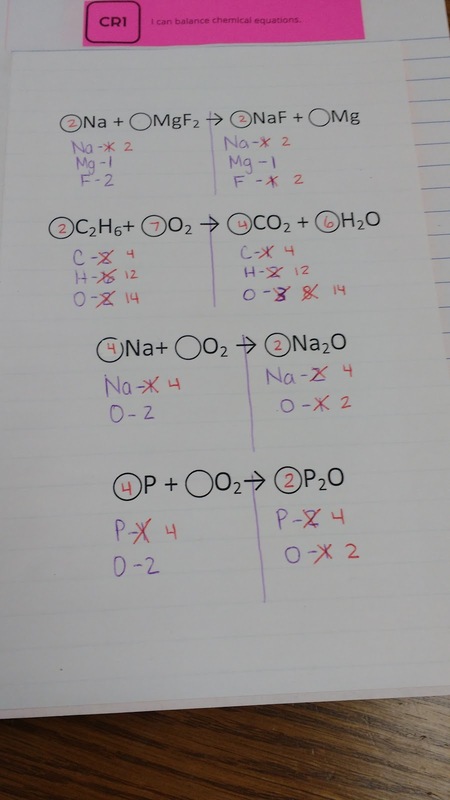 We also did some basic classifying reactions practice. 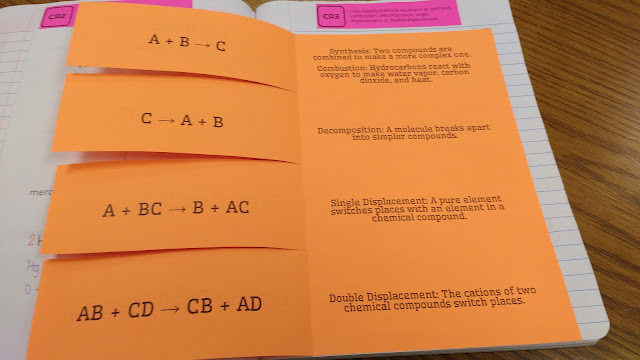 I created a card sort for my students to use to practice classifying reactions that I blogged about here. 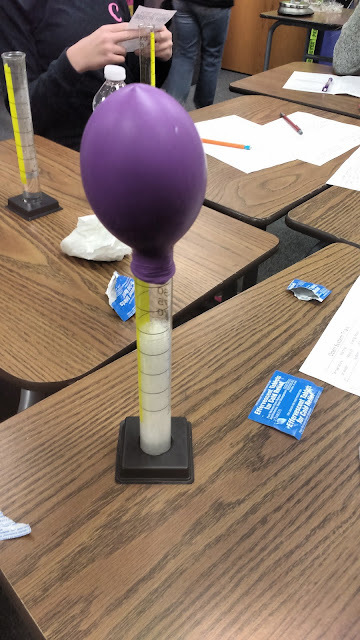 After we had learned about the different types of reactions, it meant we were ready to learn to predict the products of a reaction. I created a basketball review game to review predicting products that I blogged about here. 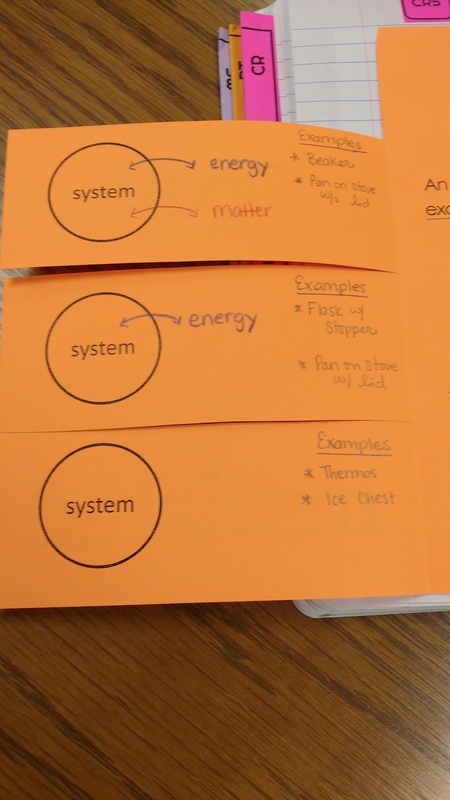 The next foldable we created summarized the different types of systems we would be dealing with in physical science. I brought some props from home to help us wrap our mind around the different types of systems. Well, the bag of ice was for another experiment, but we'll get there soon! The cooking pot without the lid was an example of an open system. The cooking pot with the lid on was an example of a closed system. 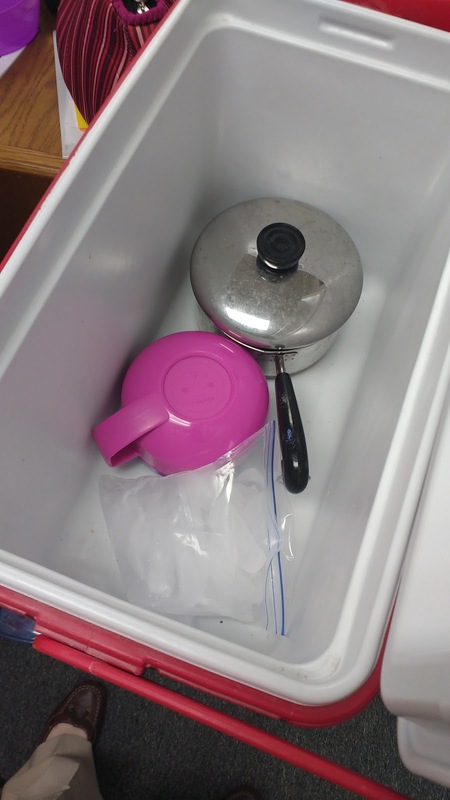 Both the thermos soup bowl and the ice chest were examples of insulated systems. 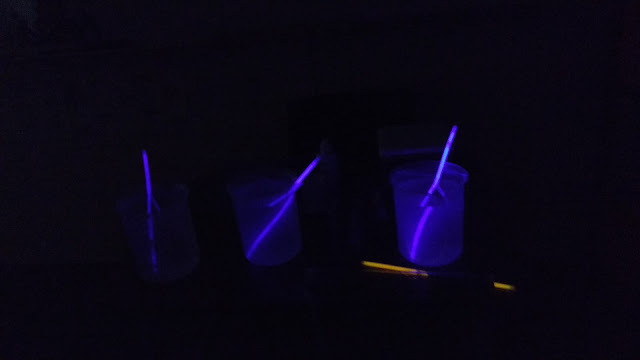 To get my students thinking about the impact of temperature on reaction rate, I decided to do a demonstration with glow sticks. 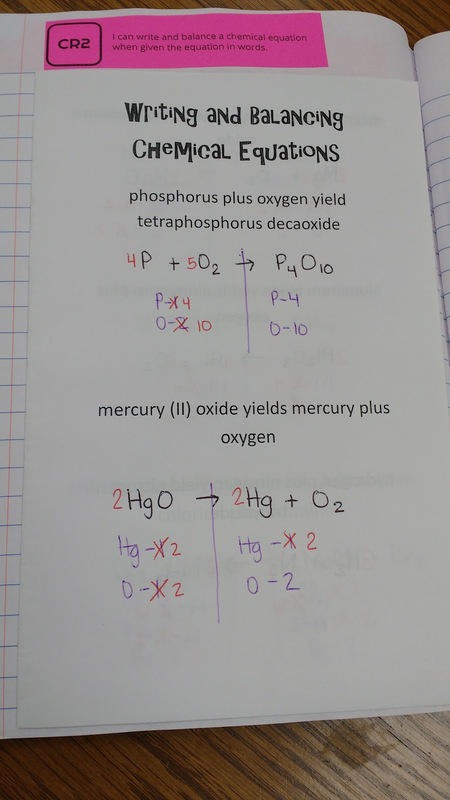 It turned into one of the most enjoyable lessons of my teaching career! The room was pitch black thanks to black out curtains from Tuesday Morning. We didn't keep the lights out all class period, I promise. 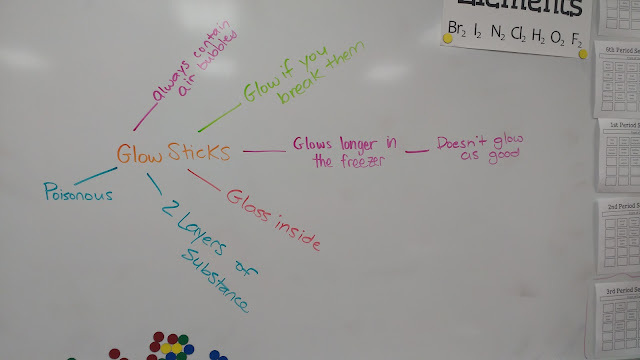 I started our discussion by writing "glow sticks" on the board and asking students to tell me everything they knew about glow sticks. My students were struggling to come up with things to share beyond obvious things like "glow if you break them." At this point, I passed out one glow stick to each student. I was nice and let them pick their color! 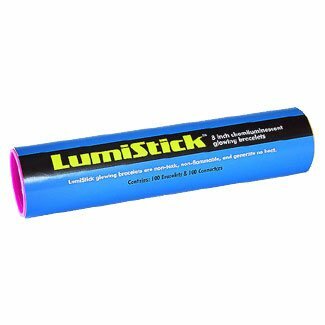 I bought a tube of glow sticks from Amazon for super cheap. These (affiliate link) are the ones I bought. Soon, students were intently studying their glow sticks. I was SO excited when a student shared that they had heard that glow sticks last longer when you put them in the freezer. We had a discussion of why this might be possible. Before long, one student accidentally bent their glow stick too much while examining it, and it started to glow. 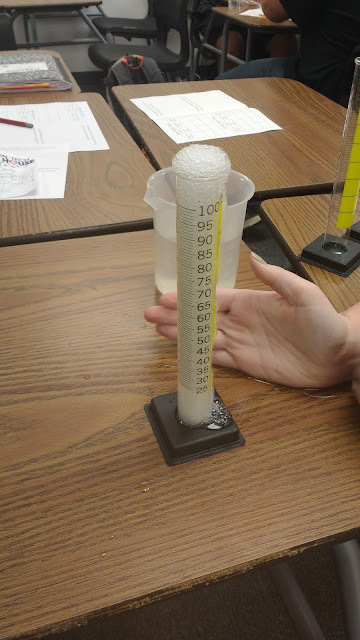 They were apologetic, but also super excited that they could see the two liquids mixing and reacting. I asked the other students if they wanted to break their glow sticks, too. They did. 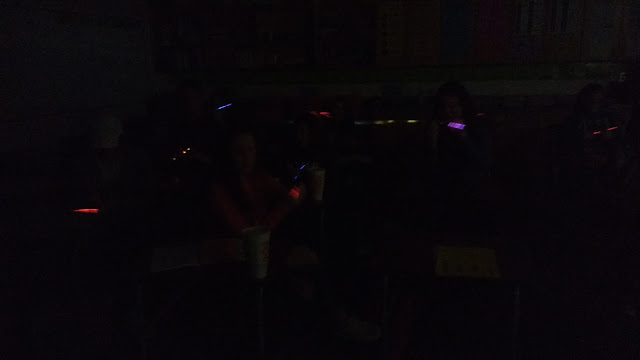 So, I turned off the lights, and my students sat there breaking their glow sticks. My students were SO engaged. They were so observant. They were so excited. It was such a beautiful thing. After a while, we turned the lights on and planned an experiment. 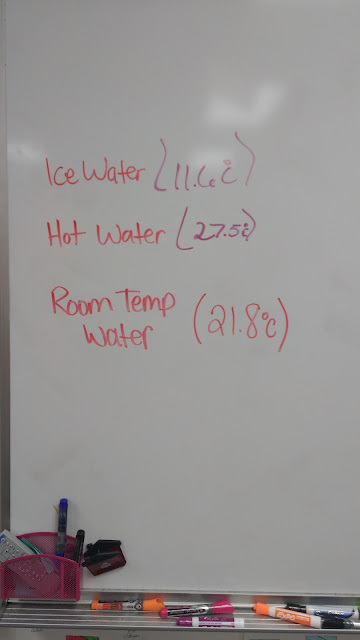 We decided to test the impact of temperature on reaction rate of glow sticks by placing glow sticks in three different temperatures of water. 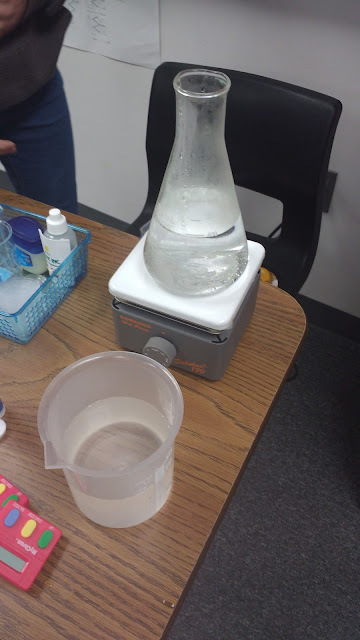 We used a hot plate to heat water in one beaker. 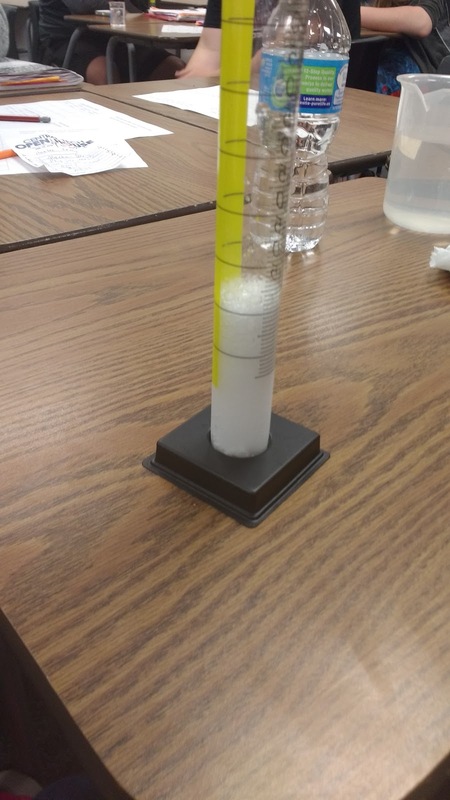 And, we placed ice in another beaker. 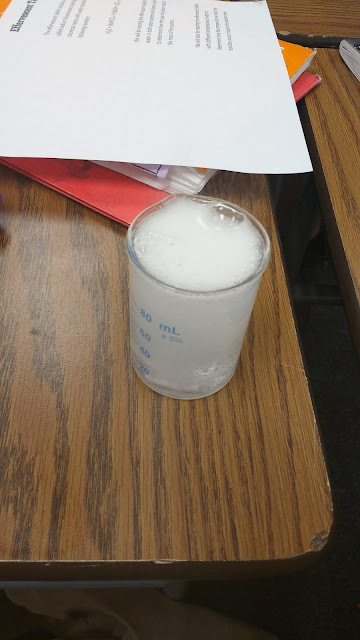 Our third beaker was left at room temperature. 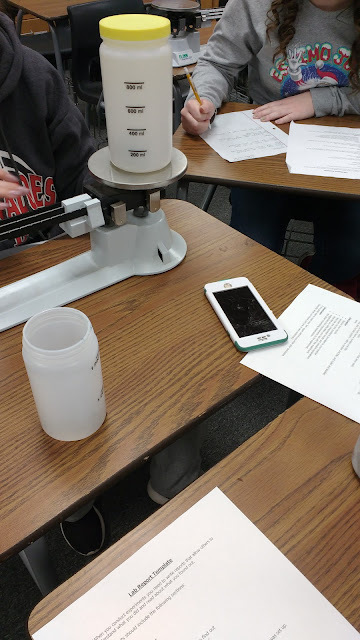 I'm so thankful for OERB for providing me with beakers, a hot plate, and a digital thermometer for my classroom. I got all this and so much more for free from attending one of their workshops. 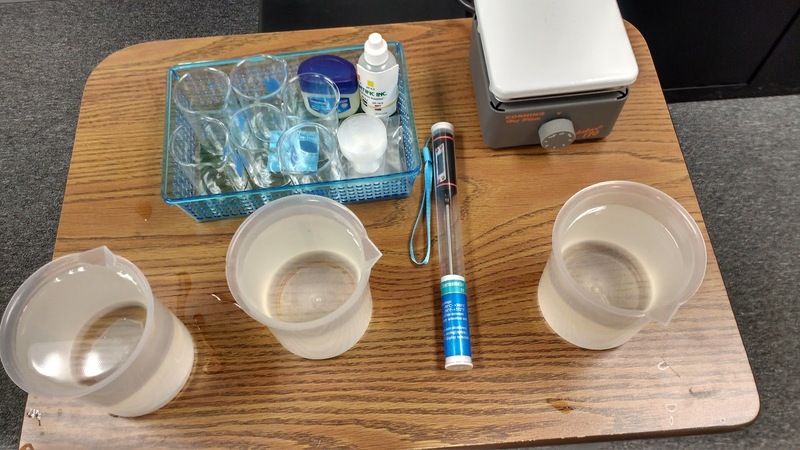 I was originally disappointed that my beakers were not big enough to fully submerge each glow stick. But, that turned out to be a blessing in disguise. Because the glow sticks were not fully submerged, the part of the glow stick that was not submerged acted the same as a glow stick in room temperature water. I was able to pull the glow sticks out of the beaker so we could see just how big of an effect the water temperature was having. My students were full of so many ideas. They enjoyed taking the glow sticks from one beaker to another and predicting what would happen. When the bell rang, they couldn't believe that science class had gone by that fast. It was really an awesome lesson! 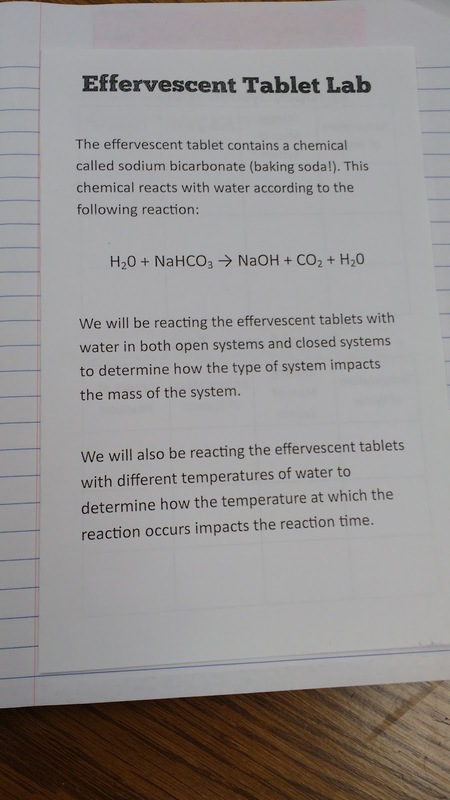 I decided to follow up our glow stick demonstration with an effervescent tablet lab. 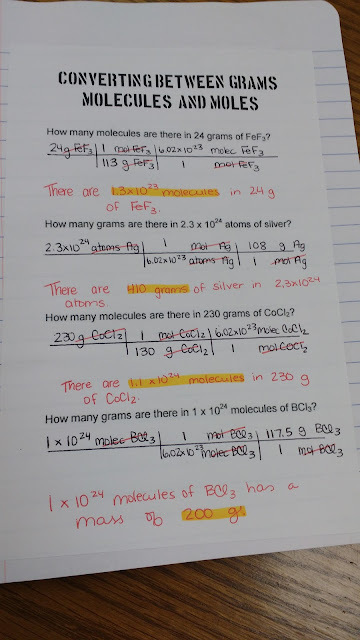 I've since found out that my students did not get to do many if any labs in their middle school science classes. They just haven't been taught how to set up an experiment to be successful. Now I know and can try to work with them. We had a few overflows that had to be cleaned up. Thank you paper towels! In the future, I will give my students step-by-step directions for their first labs of the year. 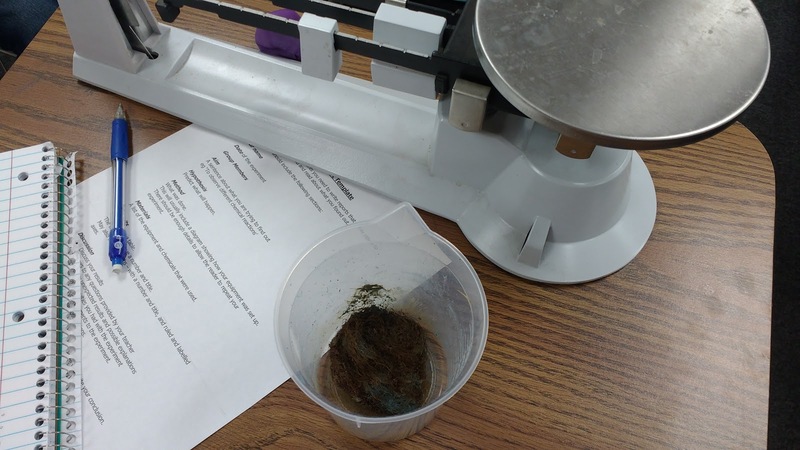 We will work towards designing our own experiments toward the end of the year. Another mistake I think I made with this lab was that I wanted them to change both the water temperatures AND the system type. I think I should have picked only one of these. I get so frustrated with myself sometimes because I feel like there is just so much I do not know about teaching a science class. I'm learning every day, though. For our next experiment, we made rust. I thought that I had learned from my mistakes with the previous lab. We spent a class period designing the lab together. We wrote a hypothesis as a class. We discussed how to set up the experiment and collect data. We used soap pads in lieu of plain steel wool because that's what I could find easily the night before at Wal-mart. 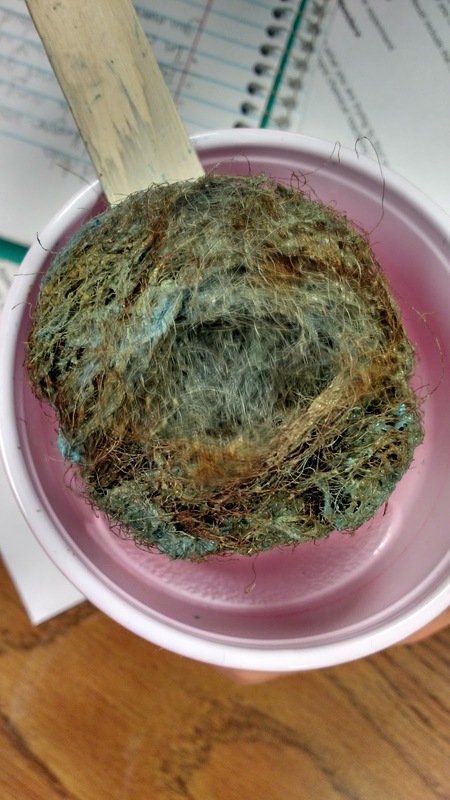 Though, maybe I should have looked in the home repair section for steel wool??? We soaked the soap pads in vinegar for around five minutes to remove some of the soap and the protective coating on the steel wool that keeps it from rusting in the box. 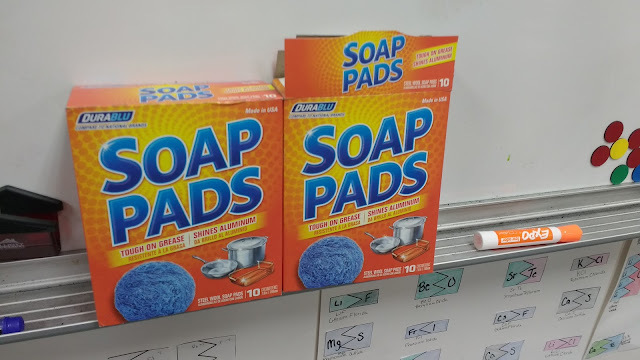 My students were convinced that the soap pads would only rust if we left them in water. The idea that they would rust in the air seemed to blow their minds. 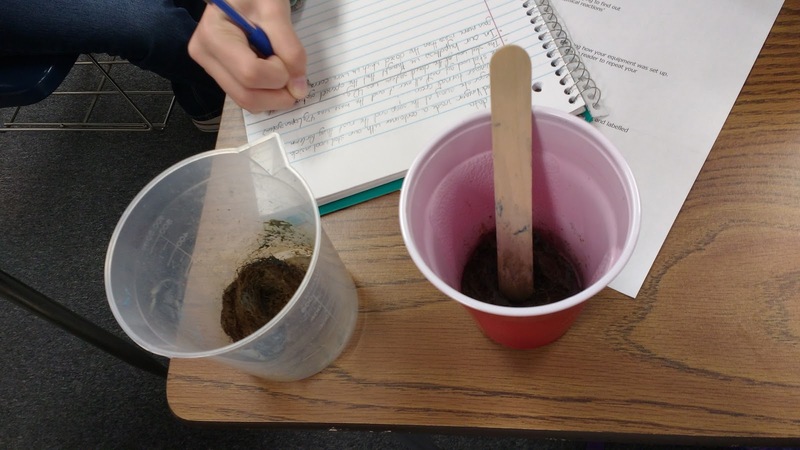 Each group squeezed the vinegar out of their soap pads and put one in an open system and one in a closed system. They measured the starting mass of each system, then we began our wait. 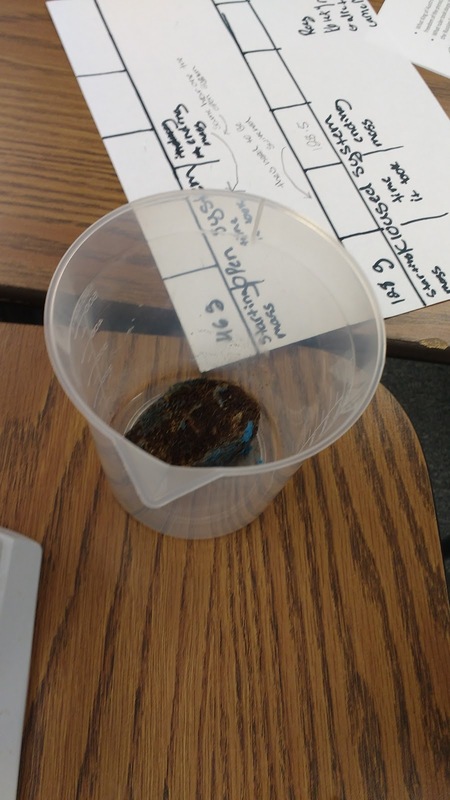 My students were convinced that we would be waiting days and days before they started rusting. I told them I didn't think it would take that long. Our physical science class is 2nd hour, and I have some of the same students in my 5th hour Algebra 1 class. 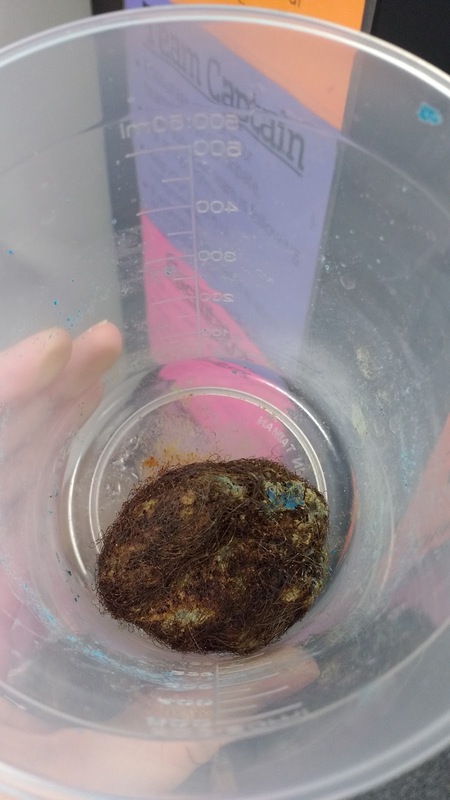 It was to see them excitedly check their experiments when they came back in my room. Now, there was an aspect of this experiment that I didn't quite think through. 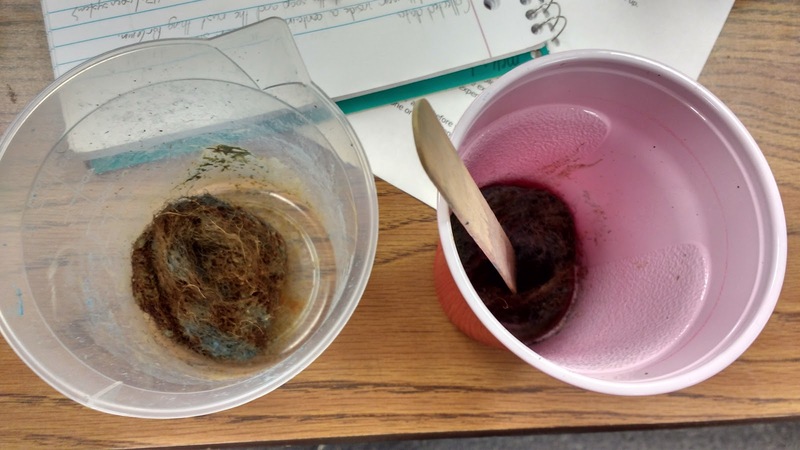 As the day went on, my classroom started to smell more and more and more and more like rust. 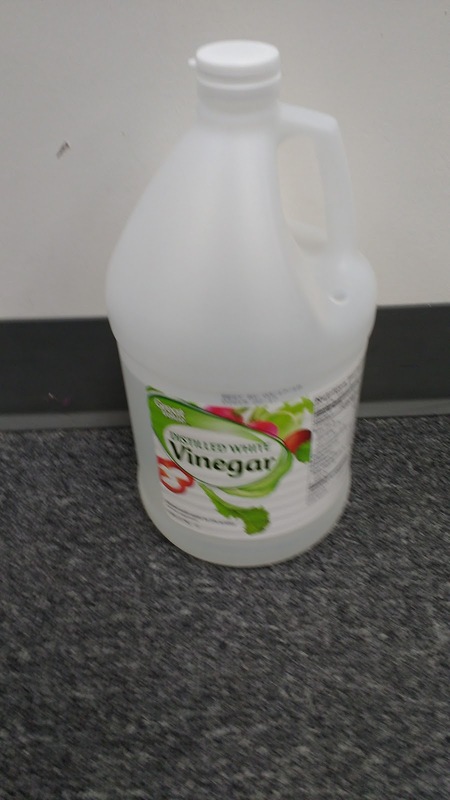 When students would walk in my room, they would immediately ask what the smell was. Rust! After a day, our soap pads had become sufficiently rusty to record our observations and record the ending masses. This was where the experiment took a turn for the worse. 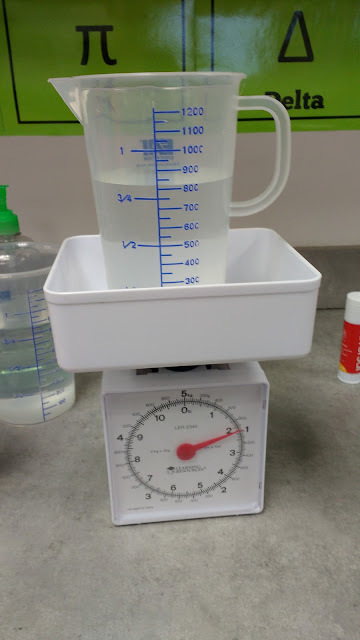 My students' measurements were ALL over the place. 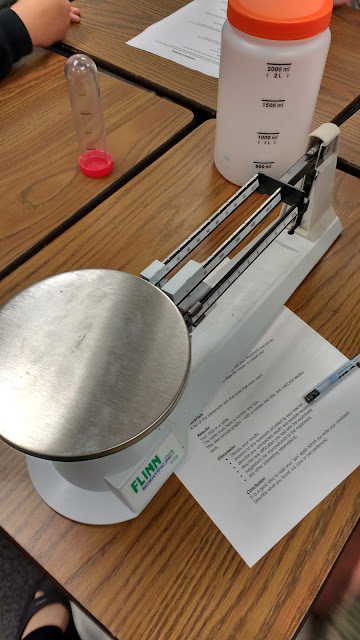 One group had a starting mass of 50 or so grams and an ending mass of 9 grams. They didn't seem to see any problem with this data that they had collected. I wanted them to see a clear correlation between starting and ending masses and the type of system. But, I'm afraid all they learned about was making rust. :( How do I get my students to take more accurate measurements??? We spent weeks at the beginning of the year practicing using scales, so I don't think it's that they don't know how to use the scales. The other thing I didn't take into consideration with this activity was that the rust would stain our containers. When my students went to the bathroom sink (side effect of teaching a science class without a science lab) to try and clean out the containers, they could not get the stains off. I ended up having to take them home and scrub them myself. 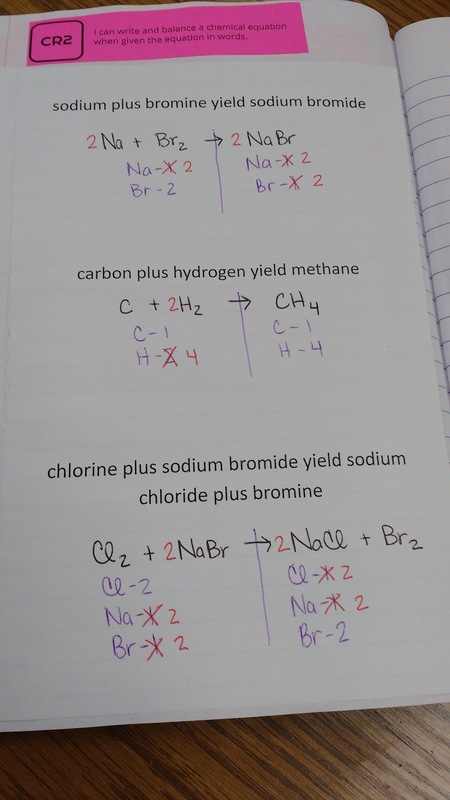 When my students wrote up their lab reports, many did not even include the hypothesis that we came up with in class together when we discussed how we would carry out this lab. My students love when we do labs in class, but I have just not found an effective way to carry them out yet. 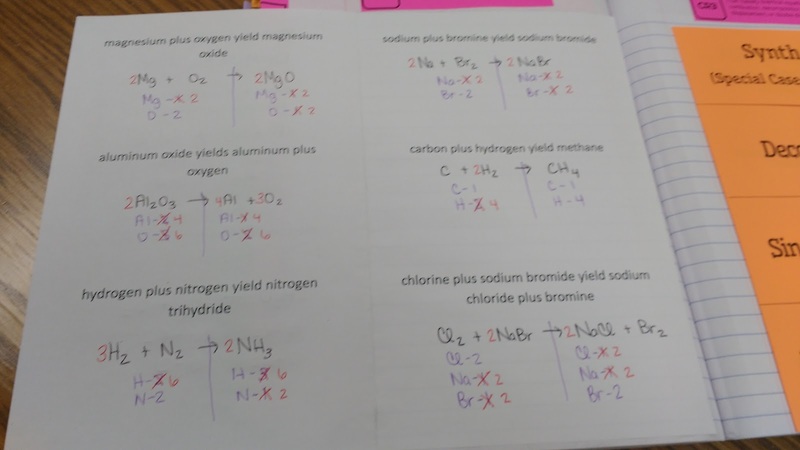 If I end up teaching another science class next year, I need to do some SERIOUS thinking about how I do labs with my students. When we got back from Christmas Break, I realized that we still hadn't done any labs to explore the effect of concentration on reaction rates. Frustrated from how our previous labs had gone, I decided to just do a whole-class demonstration so we could move on to the next skill. We worked together to create three different concentrations of water and vinegar in three graduated cylinders. 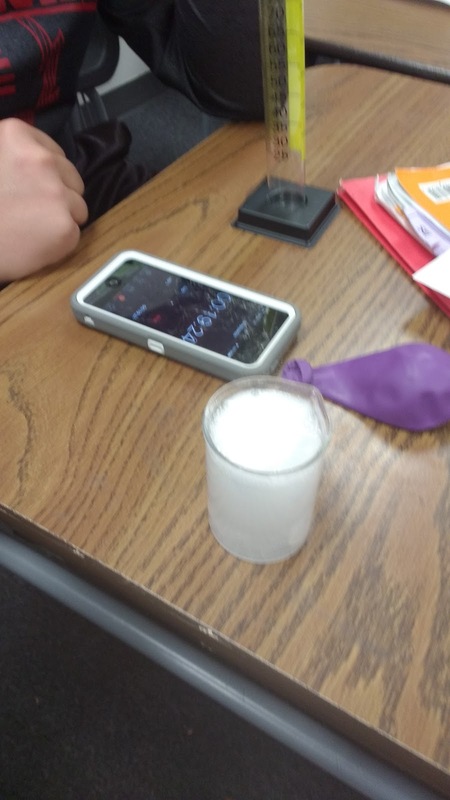 We measured the same amount of baking soda into three balloons that would be placed over the graduated cylinders to produce a closed system. 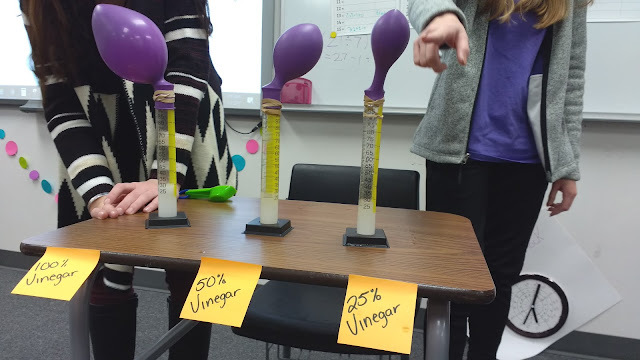 Three students stood behind the graduated cylinders and lifted up the balloons at the exact same time to release the baking soda into the vinegar/water mixtures. Of course, we made lots of predictions first. Here's a video of our reactions taking place. If the embedded video doesn't show up below, here is a direct link to the video. You can hear how excited my students were! 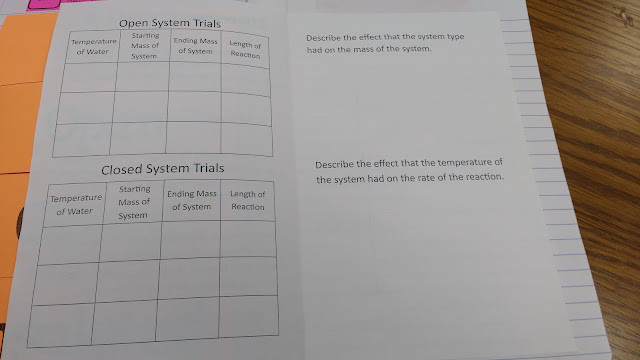 We did a quick notebook page to summarize what we had learned about the effects of temperature and concentration on reaction rates from our experiments. 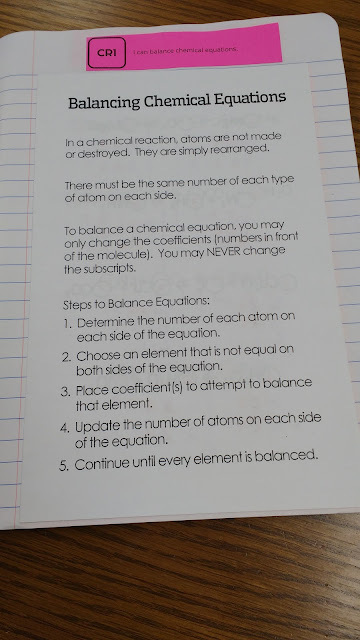 The text for this foldable came directly from this file. 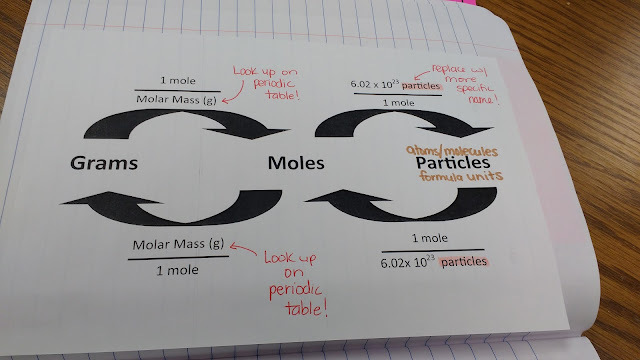 My students have found this grams/moles/particles flow chart to be super helpful when we are doing stoichiometry problems. 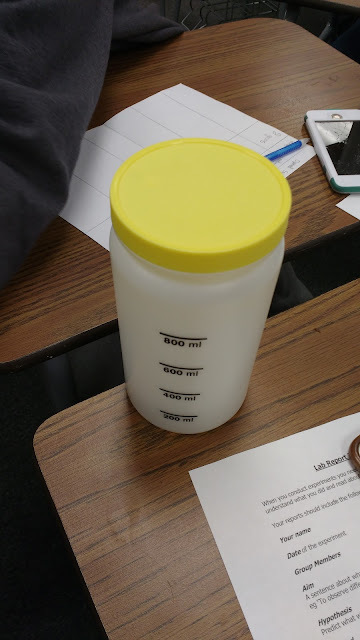 We tested our new found skills by figuring out how many molecules we would consume if we drank from the school water fountain for 30 seconds. I had my students make predictions before we started. Their predictions turned out to be waaaaaaaaaaaaaaaaayyyyyyyy off. 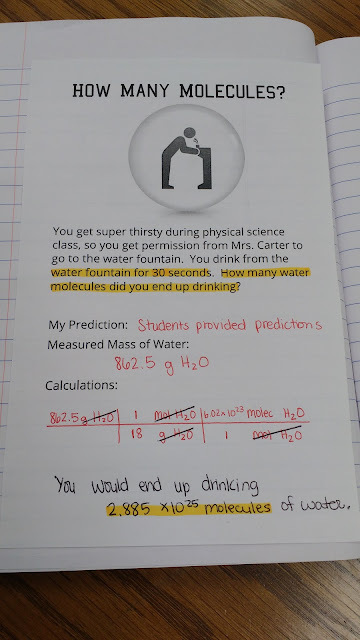 Let's just say the highest prediction was 1,000,000 molecules of water. 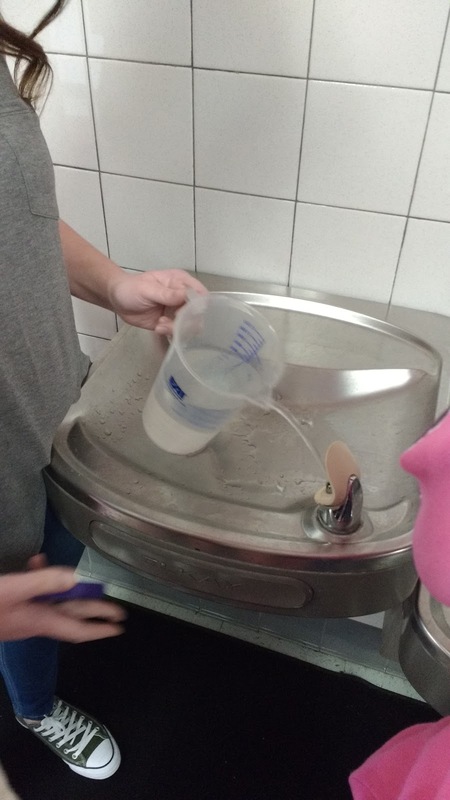 Each group collected 30 seconds of water from the water fountain. 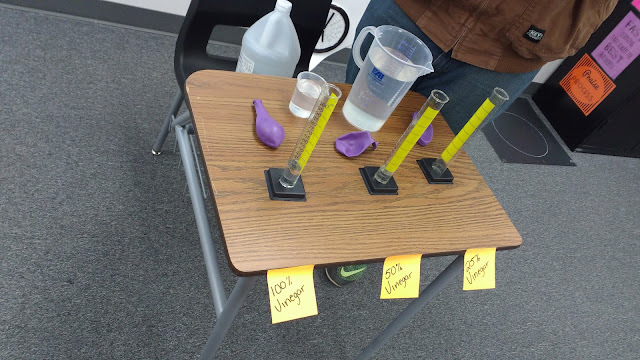 We measured the mass of water in each pitcher and averaged the results. It turns out the size of a molecule is super tiny and super hard to wrap our minds around! 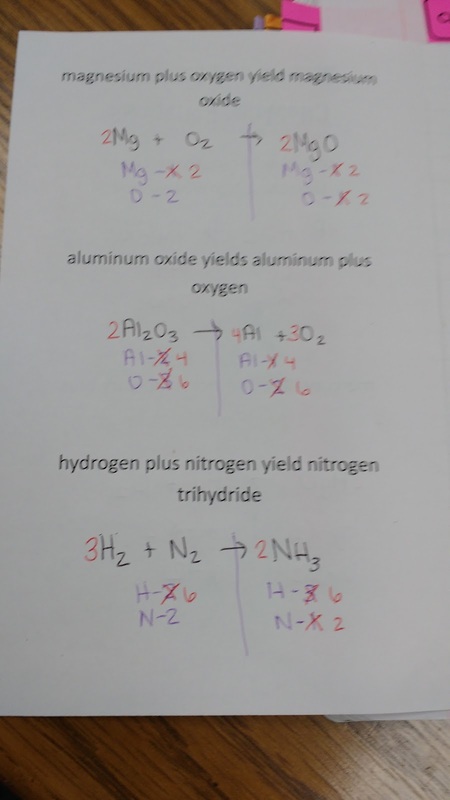 There are still two more pages for this unit that we have not done yet, so I will be sharing them later. 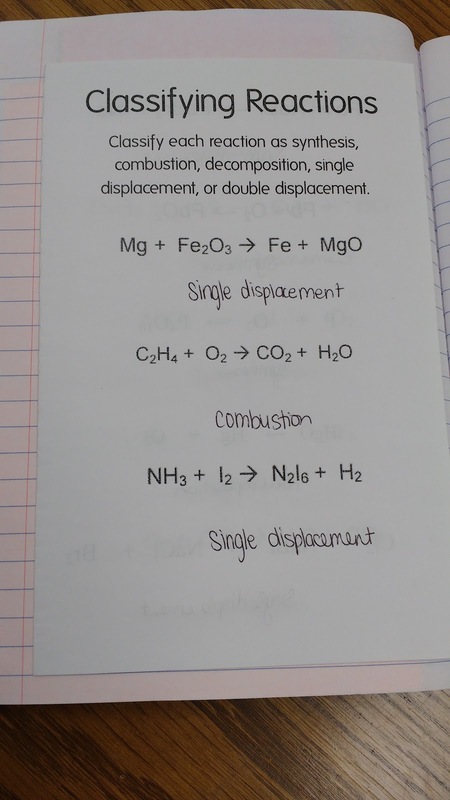 They focus on the law of conservation of mass and limiting reactants. Sarah Carter is an Algebra 2 and Pre-Calc teacher at Coweta High School in her hometown of Coweta, OK. Previously, she taught high school math and science in the small, rural town of Drumright, OK for six years. Sarah Carter is a participant in the Amazon Services LLC Associates Program, an affiliate advertising program designed to provide a means for sites to earn advertising fees by advertising and linking to Amazon.com. Posts may occasionally contain Amazon Affiliate Program links. If you purchase an item from Amazon after clicking one of these links, Amazon will pay me back a small percentage of your purchase. There are no additional costs for you.